Internal and external renovations. 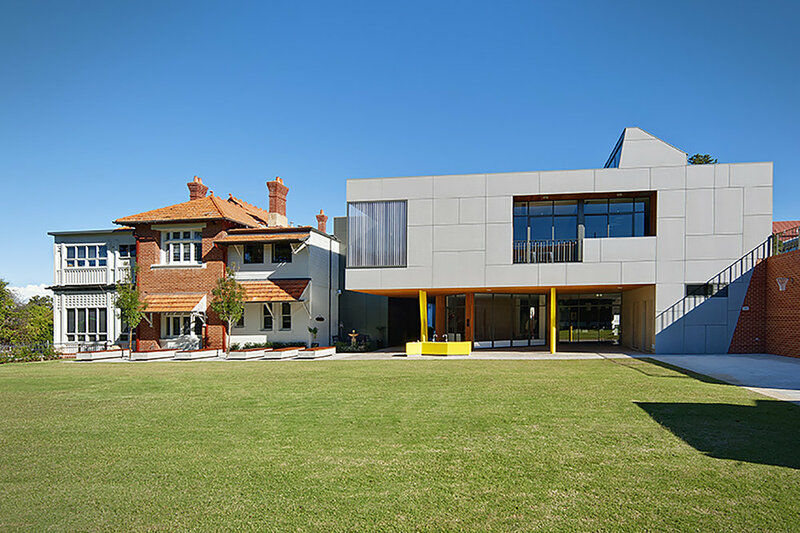 Integration of heritage listed and new buildings to create an Early Years Facility. The Founders Centre for Early Learning is a contemporary education facility for young girls from kindergarten age to year 2. Our design follows the Reggio Emilia teaching philosophy adopted by Perth College for its new early learning centre. This approach respects architecture as a major contributor to the social, intellectual and creative growth of young children, considering the space for learning as the pupil’s third teacher along with the parent and the educator. Furthermore, contemporary teaching and learning practices acknowledge all spaces, places, and communities that foster complex experiences and processes to be potential sites of learning. With the renovation and adaptation of two heritage houses and the addition of a new multi-functioning building within a landscape of terraced courts set into a sloping site, the grouping of dissimilar buildings enabled us to develop a “learning geography” of considerable stylistic, spatial and material variety that helps stimulate the imaginations of students and their teachers. The Founders Centre includes a variety of learning spaces, a library, music and dance studio, an art atelier, a multi-purpose hall with student cooking facility, a kindergarten and preparatory spaces equipped to suit young children, and after-school care. Large windows and openings emit plentiful natural light and ventilation into the new building. Bright colours emphasise thresholds, and natural and recycled materials are juxtaposed with those common to the traditional vernaculars. Combining heritage and contemporary architecture has resulted in a variety of spaces and forms, all of which enable children a full range of sensory experiences and places for imaginative play or quiet contemplation.